I field a good number of questions here and there and I like the idea of making some of them as a blog post especially when they touch on something I get asked with reasonable regularity. If I can bother you a moment, I do have a quick question on your thoughts about a few optics. As someone who’s been around awhile, I hate asking stuff like this, but with time being limited (you’ll see why in a sec), I was hoping to cut out some of the riff-raff and get right to things. I’m looking to scope a small-frame (5.56mm) precision AR. I have a S&B 4-16×42 PMII that was supposed to go on it, but I need to free up some funds for career advancement training, so I need to downgrade. I’ll DEFINITELY be looking to replace it when I can, as it’s an amazing optic, but such is life! I have experience with the two Bushnells and loved them. The LRTSi/LRHSi has slightly better glass, but is a bit darker because of the small exit pupil at full power when I use it (not terribly often, but still a consideration). The DMRII doesn’t have glass quite as nice, but is a 34mm, and does have a higher mag range and is a bit brighter at the ranges I’d most often be in. The SWFA is on the list because it’s a proven basic optic that would get me by. Stepping down that far is acceptable, but less than ideal coming from an S&B, haha. But if I needed to go that low, it would be my choice. I’m unfamiliar with the performance (tracking/repeatability, brightness, clarity) of the PST2 and Steiner/Burris offerings. I’ve read your reviews on the P4Xi and am interested, but the lack of a sunshade is worrisome, as I live in AZ and shoot in bright sun quite often. The 5-25x T5Xi sunshade works, but I’m not aware of a way to source one by itself, and I don’t yet know if Steiner/Burris will make one specific to the scope. The 3-15x seems like the next logical option, but the DMRII can be had for less with greater mag range for the rare case it’s needed, but weight becomes a penalty. The XTRII is proven, but has a lower level of clarity and higher CA on average. But you sure can beat the hell out of them, from what I’ve read over the years! If you have $1K to use, which would you use, or perhaps, how would you rank them? Primary uses would be local PRS-type matches, training, informal plinking, and some varmint hunting. Of utmost importance is tracking/repeatability, brightness, and low weight (I can probably find a used 3-18x Razor Gen2 for $1250 if I’m patient, but I’m not putting a lb+ optic on a small frame AR!). I appreciate your time and input, and hope you have a great day! For this scenario, the short answer is that I would go for Vortex PST Gen 2 3-15×44. Now, onto the long answer. Do you like mil-scale reticles like Mil-Quad, SCR or TMR? Or do you prefer some sort of a tree reticle like EBR-2D? In a market with a large number of fairly competitive designs, reticle choice can easily be the deal breaker. I do not like to compromise on reticles too much. That out of the way, a lot depends on how you plan to use the rifle. I have an accurate small frame AR and it has a 3-15×50 optic on it. I find that to be an excellent magnification range for this gun, but I shoot offhand and from weird positions a lot, which I like to do on lower magnifications, hence the need for 3x on the low end. I really like to keep the low end magnification on gas guns at 4x or lower. The best bang for the buck in the precision scope world right now is Steiner P4Xi 4-16×56 scope, but it is too big and heavy for a small frame AR in my opinion. If your AR is a dedicated heavy barrel setup, P4Xi would work fine, but based on how the question is phrased, I do not think that is what we are dealing with here. Bushnell LRHSi was a nice design, but it is discontinued. LRTSi is similar and I like it, but 4.5x on the low end gives me pause. I like to have more FOV on the low end. It is different for everyone, but I would rather give up a little magnification on the high end that lose FOV on the low end in this case. 3-15x works better for me than 4.5-18x. Bushnell DMR II 3.5-21×50 sounds like it would give you more FOV, but it doesn’t. This scope has some tunneling on the low end, so its FOV on 3.5x is almost the same as LRTSi on 4.5x. The two Bushnell scopes have FOV of around 24-25ft at 100 yards on the low end, while the PST Gen 2 has a hair over 41ft on low magnification. To me, that is a big difference. Steiner T5Xi 3-15×50 is a compelling design, but I do not think that it is any better optically than PST Gen 2. 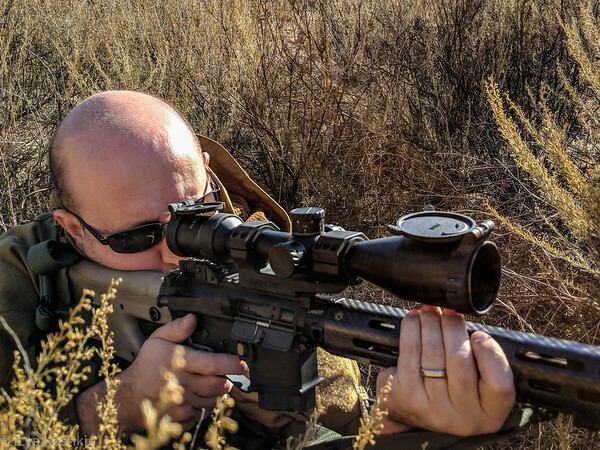 The 3-15×44 is sort of a sweetspot of the PST Gen 2 line and it is good enough to my eyes that I effectively stopped recommending other scopes of this general configuration until we get over $2k. I think the 3-15×44 PST Gen 2 punches well above its weight class and I happened to like the reticle. Now, when XTR 3 comes out, these two will something interesting to look at. Same for Optika6 3-18×50 when it gets here. Until then, PST Gen 2 is what I recommend in this price range. SWFA SS 3-15×42 is an excellent and time proven design. There is nothing wrong with and if you want to save some money, it works well. However, PST Gen 2 is basically a better and more full featured scope for not a lot more money. SWFA SS has more of a track record and focuses closer though.